The reclusive Communist state wants to talk – but only to the United States. After a year of silence, it’s willing to revisit the issue of nuclear disarmament, but it wants one-on-one time instead of the usual six-party format. A DPRK official visited the United States last week, a rarity, in what has been called a “’charm’ offensive” by Reuters. The country is desperate for money and aid. This entry was posted in Politics and tagged arms, China, Communist, disarmament, DPRK, Foreign Ministry, Japan, KCNA, Kim Jong Il, Korea, Korea Central News Agency, North Korea, nuclear, nuclear arms, nukes, Politics, Russia, South Korea, United States, weapons, wmd on November 4, 2009 by Tom. Just who the hell is looking for a Dunkin Donuts in Helsinki? Seriously! That is one of the search engine expressions used to find the Migrant Blogger today. And, I thought only America runs on Dunkins. Don’t get me wrong; I’m a big fan of Dunkins, as is my buddy Cyan from Zivity (I always love giving a bit of a shout-out to Zivity). They make the best coffee and doughnuts out there, though there are levels of quality across Dunkins stores. The product gets closer based on your proximity to Randolph, MA, where the company is headquartered. Does anyone else have a cool Dunkin Donuts story? To kick off the discussion, I leave you with my favorite, from No Shadow Kick. They are from the town where I, unfortunately, had to grow up, so they offer some great perspective. This entry was posted in Travel and tagged bike, Dunkin Donuts, Finland, Helsinki, Korea, Massachusetts, Randolph, Seoul, Uijongbu, Zivity on July 23, 2008 by Tom. I never thought I’d write about this outside the United States. 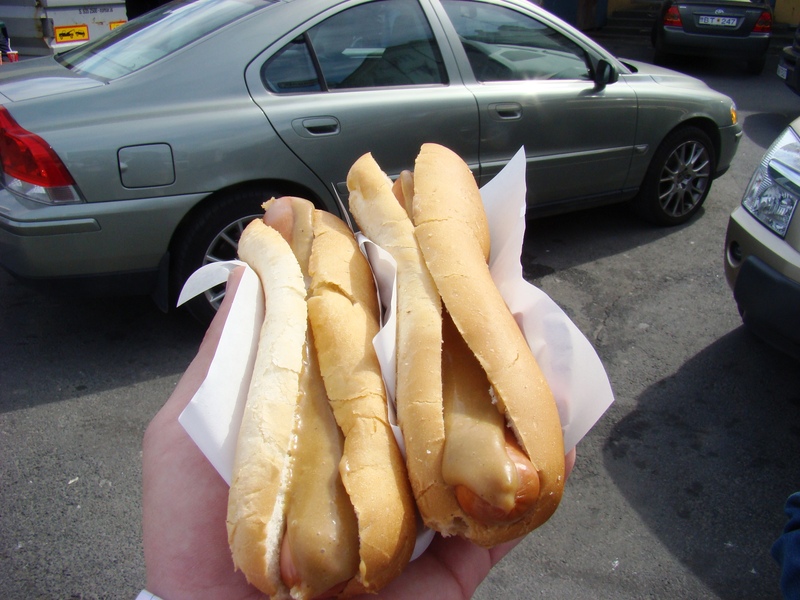 Aside from my hitch in South Korea in 1997-8, I’ve never thought about hotdogs outside my native land– not even in Canada! 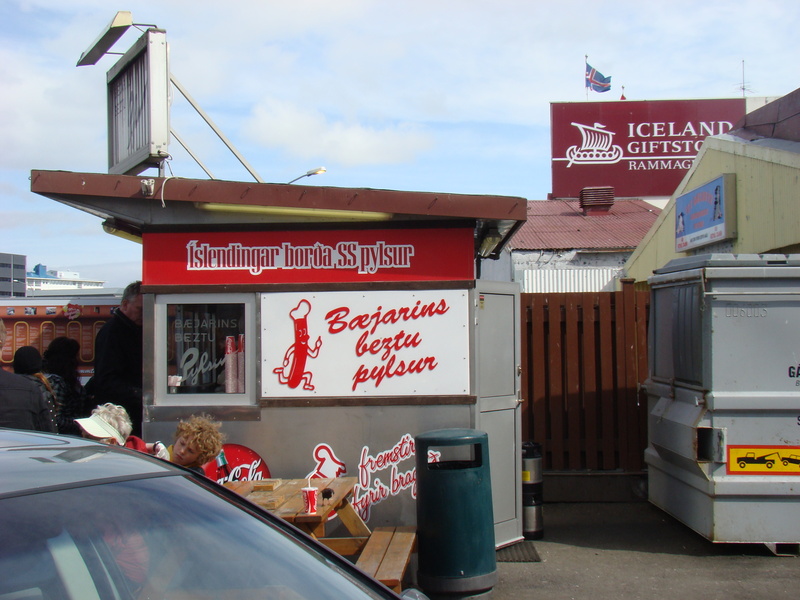 Yet, I stood in a short line (considered long by local standards) for the best hotdog in reykjavik. I was assured that it’s the best in the country. But, in a nation of 300,000 inhabitants, that’s hardly a major score. With my first day in Iceland behind me, it’s time to play “taste test” from memory. I don’t know what the name of the place is, but I hope the attached photo somehow contains it. Fortunately, the people who work there do speak English, so I didn’t have to raise my voice (which somehow makes non-English speakers fluent … it’s an American thing). I ordered two hotdogs with mustard and crossed my fingers. I was not pleased with what I saw. I was given two boiled hotdogs (or steamed, whatever) in untoasted, unbuttered hotdog rolls. The rolls would not normally be a problem, but the dogs have to be pretty amazing if you’re not going to dress it up like that. With boiled hotdogs, you’re not likely to get the best taste. So, the combination of unadorned role and boiled dog had me concerned. But, I kept an open mind. My first bite surprised me. The hotdog itself was good. I’d put it ahead of the average dirty-water stand in Manhattan, but it does not keep pace with the likes of Gray’s Papaya. The hotdog tasted like the many Oscar Mayer’s I had eaten as a kid. The mustard? That was a different story. Amazing. It is hard to describe what exactly decorated my dog, but I assure you, I entered a new dog dining dimension. Somehow, there was a slight taste of cheese, and it had to come from the mustard. Specifically, it tasted like the cheese that one would find artificially squeezed into an Oscar Mayer cheesedog. Well, it was like that but tasted much better. The entire dynamic worked. I checked the middle of the hotdog, and it was not infused with cheese. Clearly, it wasn’t coming out of the roll. So, the mustard had to be responsible. Wherever the hell it came from, I was pretty happy. I may return to this spot before I leave Iceland. While this hotdog was a pleasant surprise and could be the best in the country, it does not compare to the expertly prepared hotdogs I have eaten elsewhere. Popo’s of Swamscott, MA remains the best I’ve ever had– without any serious competition from the rest of the world. After Popo’s, I’d give a nod to Gray’s Papaya (on W 72nd St). I have fond memories of the pushcart that used to park in front of the Gaslight restaurant in Portsmouth, NH, but I don’t know if it even exists any longer. Also, “Ajumma’s Slaw Dogs”– at least, that’s what we called it– was great on many a beer-stained night when I was stationed in Korea. But, that was a decade ago, and I was loaded (likewise in Portsmouth). So, I really have no idea how good they were. 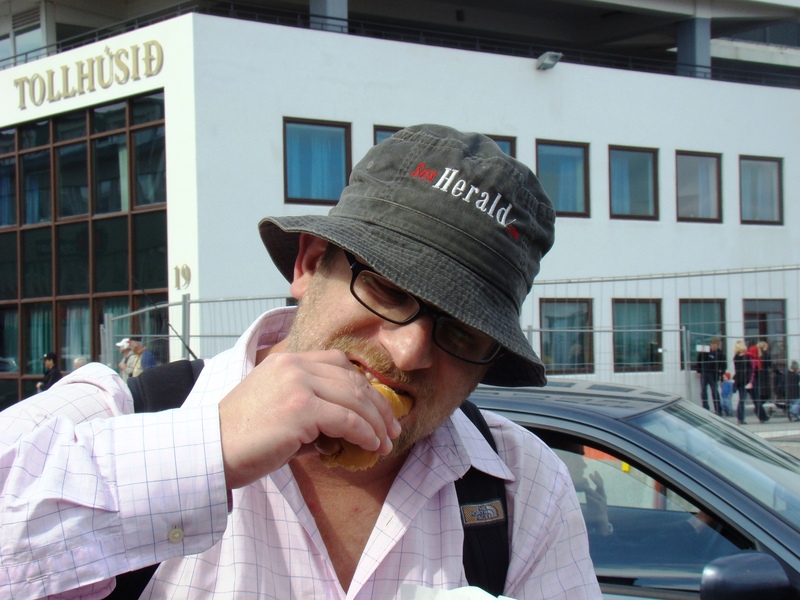 This entry was posted in New York, Travel and tagged Dining, hot dog, Iceland, Korea, Manhattan, Portsmouth, Reykjavik, Travel on June 2, 2008 by Tom.